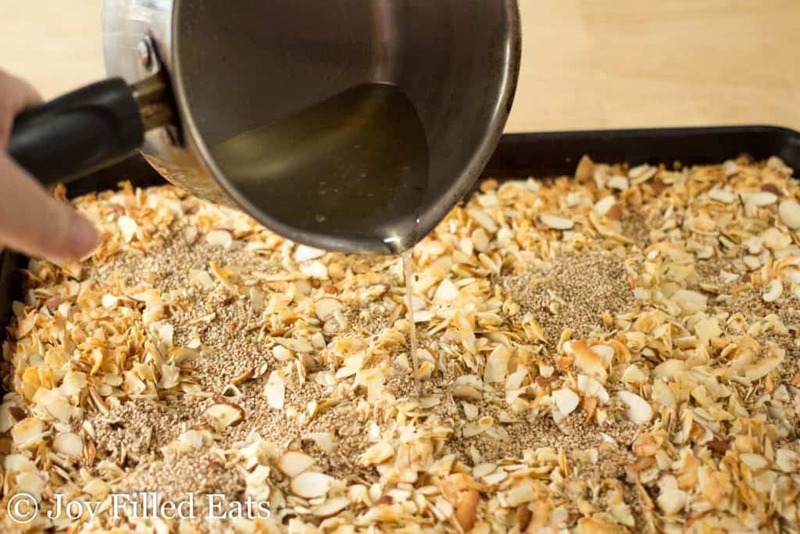 This Low Carb Granola Recipe with Almond Coconut and Sesame Seeds has the perfect crunch with just enough sweetness to sweeten your morning. It is great by the handful or as a cold cereal with almond milk. I have to admit I wasn’t really sticking to any diet whatsoever the first half of my pregnancy. My nausea was gone at about thirteen or fourteen weeks but my willpower did not come back until twenty. I tried to eat fairly healthy most some of the time. One of the things I enjoyed was Kind brand granola. It is a much better choice than Frosted Flakes or Cap’n Crunch but still has added sugar. I really wanted to try to make a grain-free, sugar-free version. The predominant flavor in that granola, to me, is the sesame seeds. They really gave the granola a unique flavor. If you google ‘sesame granola’ the Kind granola is the top result. Which is kind of funny since it is just titled Oats & Honey Granola with no mention of the sesame seeds. Since then this is my go-to breakfast when I get tired of eggs. 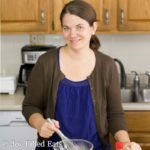 I love my Easy Egg Bake and often make a large egg bake on the weekends to reheat on weekday mornings. But there are days when I just want a bowl of cold cereal. 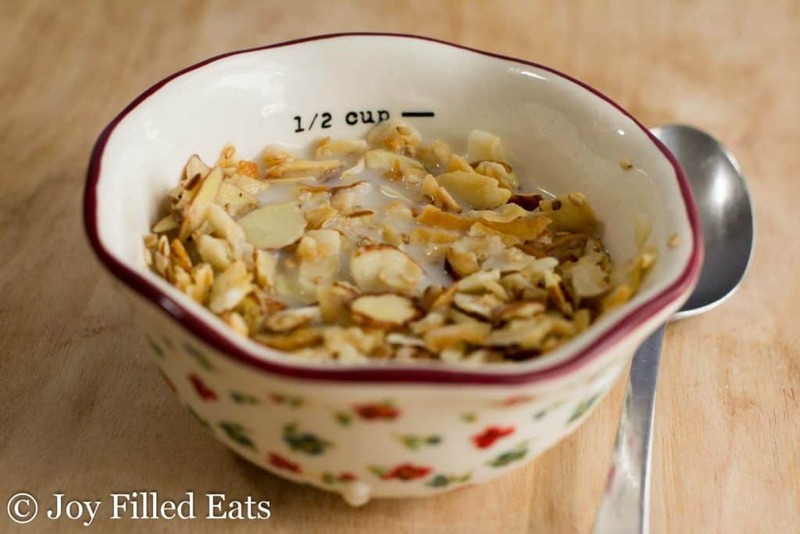 I love these little bowls with the measurements in them. They are perfect for portion control. If I’m not careful I can easily eat several servings of low carb granola at once. 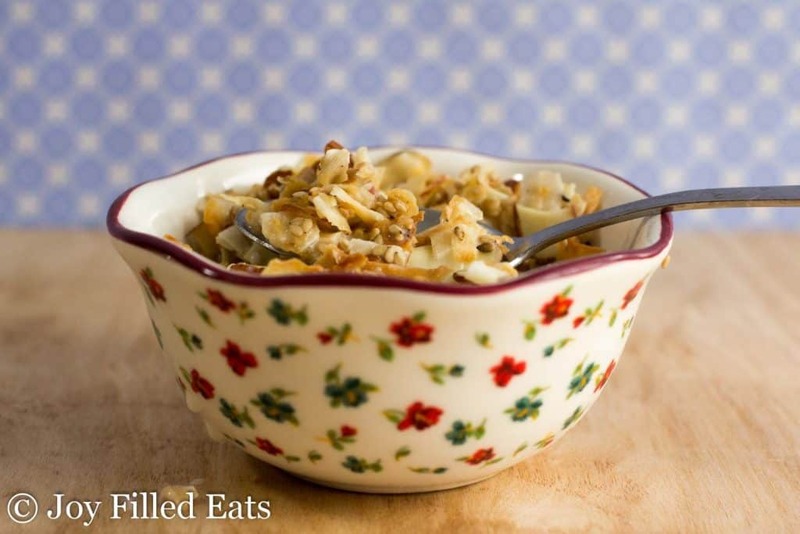 These are Pioneer Woman bowls. Cute and cheap! For my Trim Healthy Mama fans, I also have a recipe for Sugar-Free Cocoa Krispies! 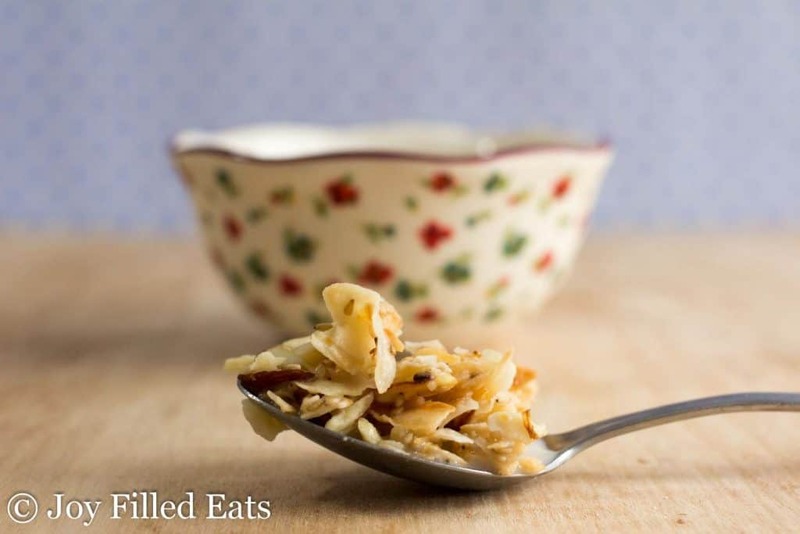 This is a healthy carb recipe so if you are doing low carb or keto it probably won’t fit into your eating plan. 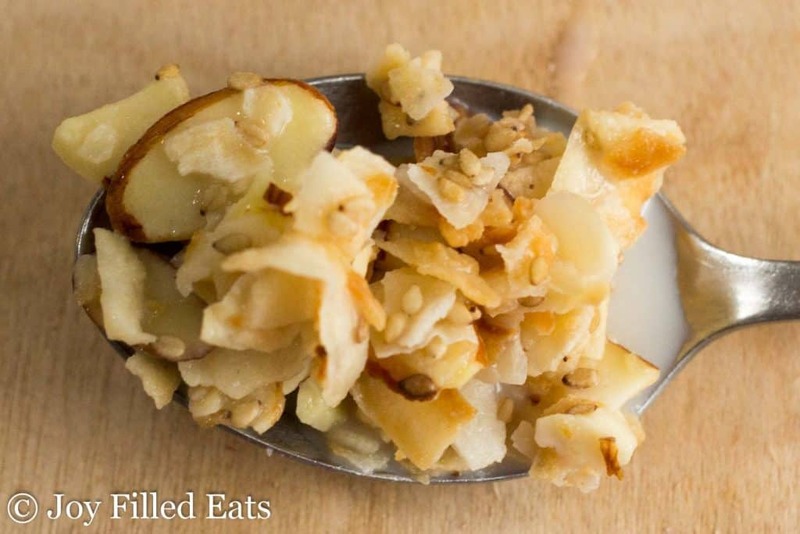 This is as easy as toasting the coconut and almonds and then pouring the syrup on top. 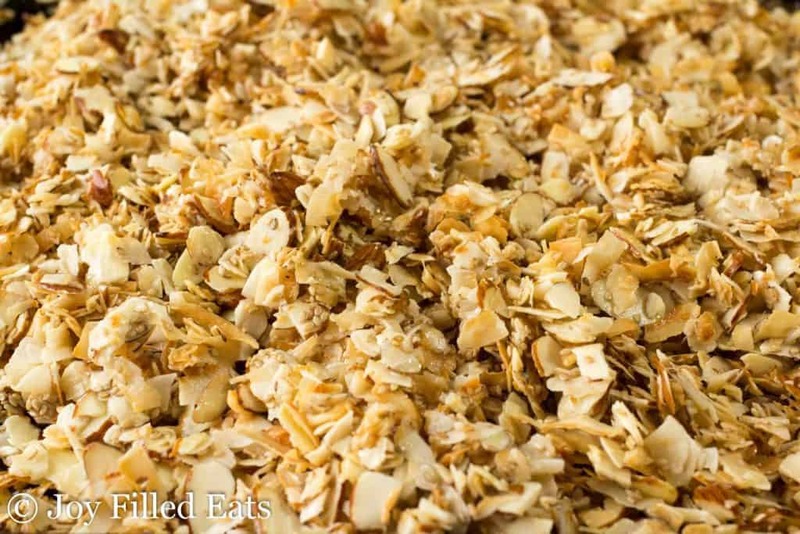 Make sure to watch the nuts and coconut carefully while making this low carb granola recipe so you don’t burn them. I can’t even count the times I forget to set the timer and burn nuts while toasting them. The best is when I also set off the smoke detector. The happens the most when baking bacon. Preheat oven to 350. Combine coconut and almonds on a large baking sheet. Bake for 5 minutes. Stir well. Bake for another 5 minutes. Stir and add the sesame seeds. Bake for 5 more minutes. Remove from the oven and stir. Meanwhile, combine sweetener and coconut oil in a small pot. Heat over low heat until the sweetener melts. Add vanilla. 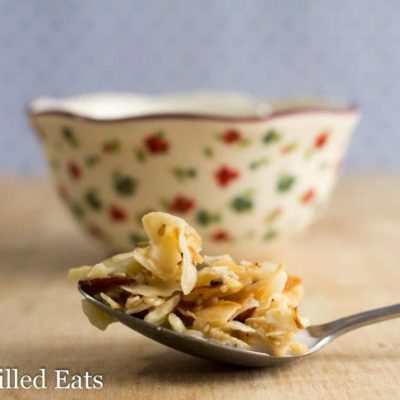 Pour the melted sweetener over the toasted coconut, almonds, and sesame seeds. Stir until coated. Cool. Store at room temperature in an airtight container. Original Published April 25, 2017. Revised and Republished December 27, 2018. I accidentally bought shredded coconut flakes at the grocery store. Can I still use them? Or does it have to be just flaked coconut? Those should work. You'll end up with smaller pieces of granola though. Omg!! Total game changer. I forgot the sesame seed and used erythritol but even without them, this is soooo good. The crunch, the sweet, the chew. Thanks so much! Hi! I made this last night and it was soooo good! Thank you for sharing. What is the serving size is with the nutrient information you listed? Hi Joelle, a serving is approximately 1/2 a cup. It's set for 1/18th of the recipe. I'm glad you liked it! Can I use solid coconut oil or does it already have to be the liquid kind? I used regular coconut oil that solidifies. 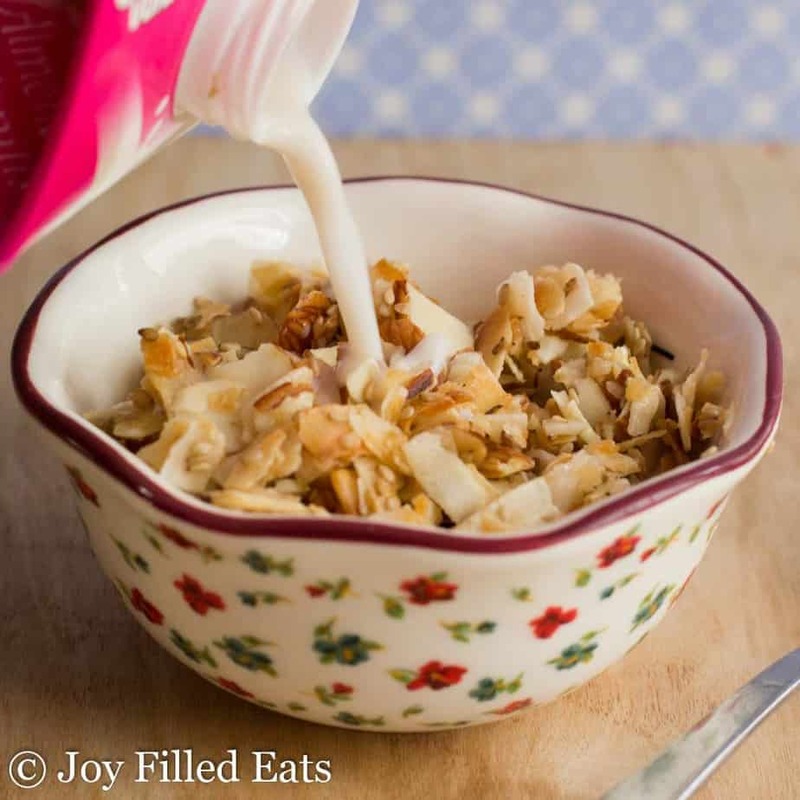 Where do you buy your unsweetened coconut flakes from? I’m hoping I can order them online! 🤞 this sounds amazing! I can’t wait to make it! Made this slightly modified. Added hemp hearts and quiona for more fiber and protein. Yummy yummy yummy, couldnt even wait for it to finish drying! Just made this and I can hardly wait for it to cool/dry before digging in. Smells and looks incredible. Another great recipe! Made this last night. Sooo good! Thank you!